The Woodlawn Panther football team was able to put aside all distractions from Homecoming Week festivities that led up to Thursday night’s game and come away with a victory over district foe St. Michael. The Panthers (5-1) were able to score 38 points and kept the Warriors out of the end zone until late in the fourth quarter, when the game was out reach and the Panthers were already guaranteed the victory. Josh London and the Panther offense come off the field after his touchdown versus St. Michael on October 5, 2017. The Panthers scoring started early in the first half, following an interception by senior defensive back Xavier Lodge. On third and eleven, the Warriors quarterback attempted to float a pass over the middle, and Lodge came down with the ball on the Warrior 38-yard line. Lodge returned the ball to the 6-yard line, setting up classmate Josh London for the touchdown run two plays later. Junior Jacob Barnes added the extra point attempt, and the Panthers led 7-0. After forcing a punt, the Panther offense stalled, but Barnes was able to add to the lead with a 43-yard field goal, putting the Panthers up by the score of 10-0 with 4:24 to play in the first quarter. Woodlawn added its second touchdown of the quarter on senior quarterback Brian Byrd’s 40-yard scamper. After Barnes’ extra point attempt was true, the scoreboard read 17-0. 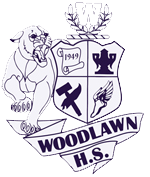 Woodlawn’s offense continued to click on all cylinders. The Panthers went back to the ground and scored on the second play of the second quarter from 36-yards out. This time senior Chris Middleton found the end zone, and Barnes PAT put the Panthers up by a commanding 24-0 lead. Woodlawn would reach pay dirt on one more occasion in the first half, when Byrd found junior wide receiver Bryant Jacob alone in the end zone for the score. The point after by Barnes made the score 31-0. The Homecoming Court watches the Homecoming Game. After receiving the second half kickoff, Woodlawn used eleven plays to score for the final time of the night. Lodge took the hand off from 35-yards out, racing untouched for the touchdown. Barnes once again added the extra point for the 38-0 Panther lead. The Woodlawn offense totaled 281 yards in the Homecoming victory, with 187 yards coming on the ground. In total, five Panthers found the end zone during the night. The defense was once again dominant, shutting the visiting team out until under two minutes to play in the game. The defense also held the Warrior offense to 198 total yards. Byrd led the Panther offense with 159 total yards, with 94 of those yards coming through the air. Byrd was responsible for a touchdown on the ground and through the air. Lodge added 47 yards on three carries, Middleton carried twice for 39 yards, and London had nine carries for 31 yards. Each added a touchdown on the ground. Bryson Reaser had 61 yards receiving on one catch. Jacob caught the one pass for 14 yards and a touchdown, while Tyrell Smith had one reception for 11 yards. London added one catch for eight yards. Cheerleaders show their support for Breast Cancer Awareness Month. Senior linebacker Talbot Daniels was extremely disruptive to the Warrior offense, totaling 11 tackles with a sack, tackle for loss, and sack. The Panthers will be the visiting team despite playing at home versus Tara on Thursday, October 12.